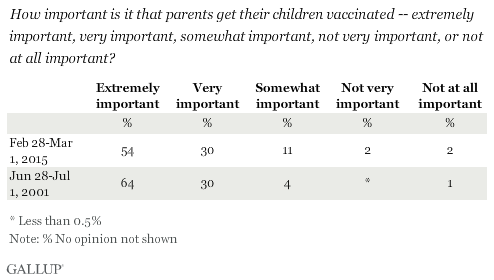 PRINCETON, N.J. -- A slight majority of Americans, 54%, say it is extremely important that parents get their children vaccinated, down from the 64% who held this belief 14 years ago. Another 30% call it "very important" -- unchanged from 2001. The rest, 15%, consider it "somewhat," "not very" or "not at all important," up from 2001. These results, based on interviews conducted Feb. 28-March 1 on Gallup Daily tracking, follow a relatively large measles outbreak in the U.S. stemming from pockets of unvaccinated children. This outbreak called attention to the continuing controversy over the possibly serious side effects of vaccines, a hypothesis advanced by some anti-vaccine activists, but vigorously denied by most doctors and scientists. Gallup originally asked questions about vaccines in 2001, the year the mercury-containing preservative thimerosal was removed from most childhood vaccines as a precautionary measure. Large majorities within every major demographic group say it is extremely or very important that parents get their kids vaccinated. Views on vaccinating children are related to education and age; those with the highest education levels and Americans aged 30 and older are the most likely to say it is important. Parents of children under 18 and those who are not parents of young children hold similar views on the importance of vaccines. Overall, Americans are more likely now than in 2001 to say they have heard about both the advantages and the disadvantages of vaccinations for children. Americans remain significantly more likely to have heard about the advantages of vaccines than about the disadvantages, although that gap has closed since 2001 -- given that the increase in the percentage who have heard about the disadvantages is substantially larger than the increase in those who have heard about the advantages. Although Americans are slightly less likely than they were in 2001 to say vaccines are extremely important, the percentage who say vaccines are more dangerous than the diseases they are designed to prevent has not changed much -- 9% now vs. 6% in 2001. 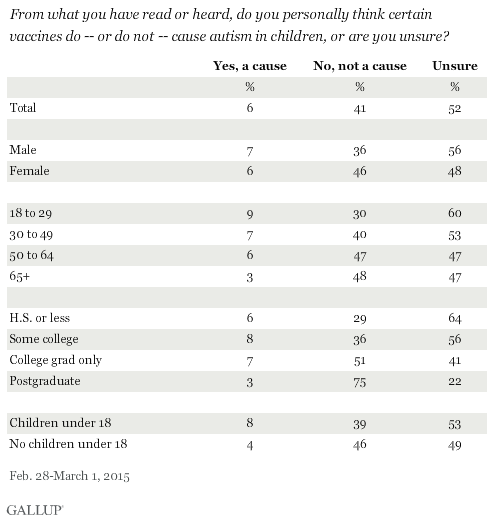 Six percent of American adults say they believe certain vaccines cause autism in children. Forty-one percent expressly disagree with this claim, while slightly over half of Americans are unsure. The belief that certain vaccines cause autism in children is one of the major controversies surrounding vaccines. This claim is based in part on a now largely discredited article published in a British medical journal in the 1990s, and public pronouncements on the subject by celebrity Jenny McCarthy. Various politicians in the years since have also created controversy with their statements on the issue. The U.S. government's Centers for Disease Control and Prevention denies any connection between the two, saying, "CDC supports the [Institute of Medicine] conclusion that there is no relationship between vaccines and autism rates in children." The American Academy of Pediatrics similarly says, "There is no scientifically proven link between measles vaccination and autism." There is little variation in views that vaccines cause autism across demographic groups, varying within a few percentage points of the 6% average for the adult population. Younger Americans and those without college educations are most likely to say they are unsure about a causal link, and parents of children under 18 -- a group that is younger than the overall population -- are slightly more likely than others to affirm the link. The percentage of Americans who believe that vaccines can cause autism is no higher than average among those who have heard a great deal or a fair amount about the disadvantages of vaccines, suggesting that the belief is not directly tied to the recent news coverage. Americans are much more likely now than 14 years ago to report having heard about the disadvantages of vaccines, while at the same time they have grown a bit more likely to have heard about the advantages. Despite increased awareness of the criticisms, the vast majority continue to say that it is important that children be vaccinated. Still, the discussion of vaccine disadvantages may be having some effect, as the percentage who say vaccines are extremely important is down slightly. Additionally, a small segment of the population remains skeptical about the benefits or safety of vaccines -- including 9% who say vaccines are more harmful than the diseases they are designed to protect, and 6% who say certain vaccines can cause autism. Results for this Gallup poll are based on telephone interviews conducted Feb. 28-March 1, 2015, on the Gallup U.S. Daily survey, with a random sample of 1,015 adults, aged 18 and older, living in all 50 U.S. states and the District of Columbia. For results based on the total sample of national adults, the margin of sampling error is ±4 percentage points at the 95% confidence level. All reported margins of sampling error include computed design effects for weighting. Although studies show that more than 70% of American children are receiving all of their medically recommended immunizations today, there have been news reports discussing the possibilities that vaccinations can have side effects and actually cause the diseases they were designed to prevent, or cause such conditions as autism or diabetes. Some health care professionals have raised concerns that these news reports could affect parents' attitudes about vaccinations and, in turn, negatively influence vaccination decisions. A recent Gallup poll, however, shows that Americans are well aware of the benefits of vaccinations; that the majority of Americans say they have heard little or nothing about disadvantages associated with vaccines; and that very few Americans agree that vaccines are more dangerous than the diseases they are designed to prevent.